By day or by night Exeter has some great places to eat! Devon's capital city will not disappoint when it comes to eating out. 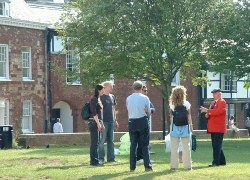 Exeter is developing in to the county's centre for cuisine with a growing choice of restaurants and places to eat. 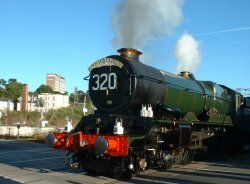 Are you visiting Exeter for the first time or do you just want to know some of what's available? 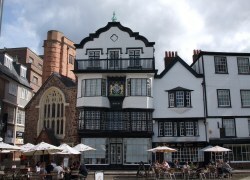 This page gives just a brief and mini overview of Exeter Restaurants. Lots of different tastes are catered for through the continuously growing and cosmopolitan range of restaurants that Exeter has to offer. These range from Italian to Spanish and from Greek to Indian. However, should you require a more traditional English dish then Exeter will not disappoint, the city has lots of fine restaurants waiting to tempt your taste buds! And with such a diverse and various choice of establishment available, there should always be somewhere different to try throughout your visit. A selection of entries taken from the ExeterViews.co.uk Restaurant Directory. These are not listed as editor recommendations or advertisements of any kind. They have been randomly selected from the wide choice available. Restaurant in Queen St, Exeter serving Latin American food and cocktails. Mediterranean restaurant on Exeter Quayside. 16th Century inn and restaurant. Clyst St Mary, nr Exeter.